Amp up your VFX arsenal with these Nuke nodes. Nuke is the cool kid on the block for compositing software. A staple in both film and commercial workflows, The Foundry’s 3D node-based compositing software is a must-have in the arsenal of any 2D visual effects artist. Learning Nuke, however, is no short order. The depth of the software is nearly endless with a barebones layout that offers expansive customization, full scripting capabilities, and a third party library of thousands of toolset and plugins. When you’re a beginner taking on the program for the first time, its visual-based layout and simple starting tools let most users find their bearings rather quickly—but as you face more advanced tasks, the tools necessary to get the job done become increasingly complex. Nuke has nearly 400 nodes with infinite uses and capabilities. If you can use a hammer to either insert a nail or remove it, imagine what you can do with something called O_DepthToDisparity. The best way to learn these functions is to encounter them in a critical thinking context. Sometimes this is on the fly, with a tip from a peer, or from a snippet you find online. In any case, it never hurts to familiarize yourself with Nuke’s tools ahead of time. These are four nodes to push your comp game to the next level. The Foundry is based in the UK, so, for now, we’ll keep the “u”. 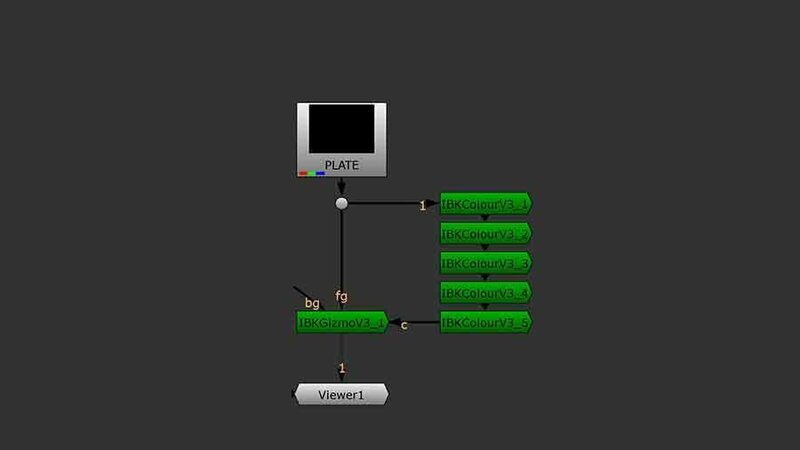 IBK Colour is one of Nuke’s advanced keying tools and a component of the IBK Keyer alongside IBK Gizmo. Even as one piece of a whole, IBK Colour is an impressive gadget that is used to create clean plates from keyable footage. Like many nodes in keying especially, using IBK Colour is a delicate art of push and pull as your goal is to extend the edges of your screen into your foreground elements. Where IBK Colour reaches its full potential, however, is through a technique called IBK stacking. IBK stacking is when you use several IBK Colour nodes one after the other to incrementally generate your clean plate. This usually leads to a better clean plate with less contamination from the edges of your foreground. There are plenty of ways to approach a key, but this is a great first line of defense when you’re facing uneven or poorly lit screens. IDistort is a node in the transformation class that warps an image based on values in the UV channels. One of the best properties of Nuke is that it offers you complete control over the channels of your signal. This allows you to manipulate and change over time the data that your IDistort is using. One common source that can be used for an IDistort UV channel is a simple noise node. This allows you to create maps for warping your footage. Throw some animation on, and you have heat waves and ripple effects perfect for a firey stock footage comp. At a more advanced level, IDistort can be used alongside matrices and mathematics operations to determine what transformations will occur to your image at a pixel by pixel level. A common application of this is an edge extension technique which creates fake spill-free detail in keyed footage. Like IBK Colour, SmartVector is the first step in a two-node process. To start, SmartVector analyzes the movement of each pixel in your frame and creates motion vectors to match. From there, the data is used with a VectorDistort node for application. The smart vector workflow offers an alternative for many tasks which are painstaking and frame by frame endeavors. From tattoos to beauty work, to paint and clean up, smart vectors can single-handedly replace hundreds of keyframes across planar trackers, spline warps, and more. It’s a relatively new feature too, so expect constant improvements from the Foundry. Nuke’s strength comes from the granular levels of control you’re given of your composition. One of the intimidating facets of this, however, is when you realize how deceivingly simple some nodes are. A quick mouse over the operations of a Merge node for example, and you’ll see that it, like most nodes, is an RGBA math machine. If the Merge node is like using preset functions on a graphing calculator, the Expression node is like doing long division with pen and paper. At face value, the Expression node is simple: you’re given multiple fields to perform operations on preselected channels. 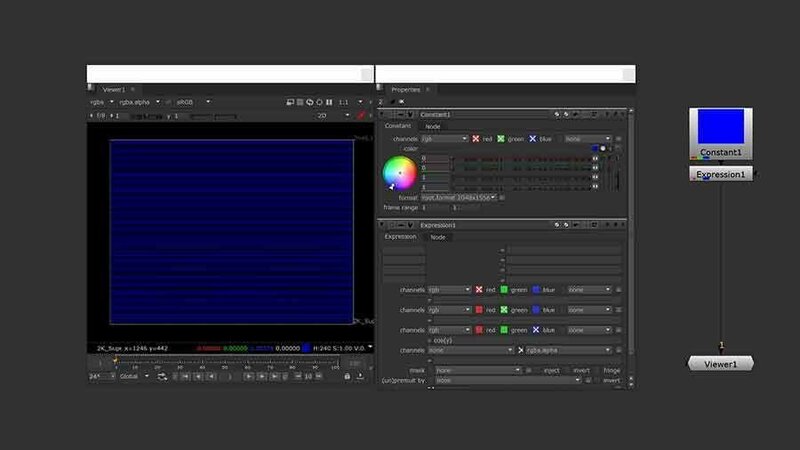 For example, if you send an RGB signal of [0,0,1] through an expression node, and input “g” for the blue channel field, you’ll end up with a black image as blue is set to the value of green which is zero. The Expression node is extremely powerful and can be used for anything from fractals and patterns to despill and custom Merge operations. You can apply trigonometric functions, conditional statements, quadratics, and much much more. Couple this with the ability to add user knobs, custom scripts, and parenting with other nodes and Expression shapes up to be one of the most important nodes in the Nuke library.